A petrol tanker caught fire in Nigeria’s biggest city, Lagos, killing at least nine people, officials say. By Friday morning the full scale of Thursday’s tragedy was still visible as rescue workers clear the road of the burnt-out remains of the vehicles. An acrid smell still hangs in the air. It’s a gory scene many Nigerians are all-too familiar with. Oil tankers have been involved in some of Nigeria’s worst road accidents. Many of these tankers were conveying imported fuel from the Lagos port for distribution around the country. Even though Nigeria is the world’s sixth largest exporter of crude oil, the country imports virtually all its fuel because its refineries are not working due to years of mismanagement. The Lagos port remains the main entry for the fuel that serves Nigeria’s almost 200 million people. It is a disaster always waiting to happen in a country where fuel distribution is in the hands of often reckless oil tanker drivers. Most of them are driving tankers imported from Europe that are not roadworthy. 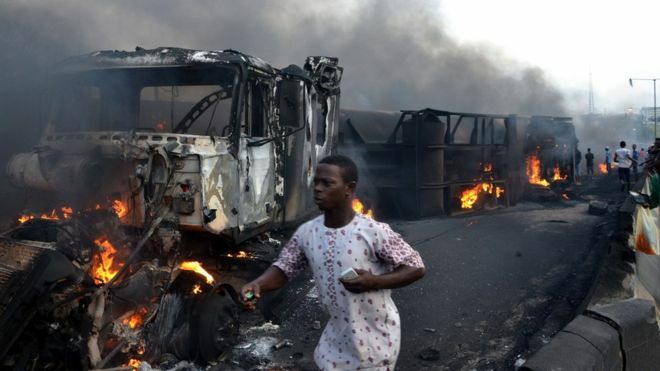 While Nigerians mourn the victims of this latest accident, many know it may not be the last, if efforts are not made to get good drivers and vehicles for Nigeria’s fuel distribution business.